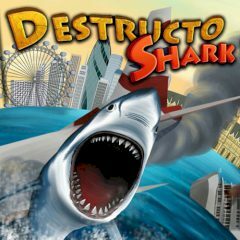 Play as the big and very dangerous shark and... eat all people! Are you already fascinated? So, the rules are quite simple, you just have to control the huge fish and feed it. Use arrows to move and space to swallow the food. Enjoy this game and be the king of underwater world! Would you like to live the shark's life? Then do not waste your time and try it! As you know, all sharks like to eat meat. A lot of meat and it does not matter whether it is people, fish or animals. So, your task is to control this dangerous shark and eat as many people as possible! Use arrow keys to control it and space to open the mouth. Be sure that you will cope with such an exciting goal. It has so many sharp teeth that she can eat almost everyone! So, do not let your chance to slip and play as a big shark!